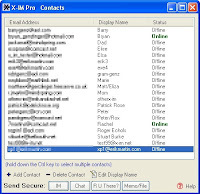 o Secure Instant Messaging – Send instant messages to any other X-IM user. If the remote user is not online (or has their computer off, etc.) the message will be held until the user goes online, at which time it will be delivered immediately. From inception to delivery the message is encrypted with the recipient’s public key, making it impossible for anyone but the recipient to read the message. o Firewall Compatibility – X-IM is designed to automatically connect you with your contacts regardless of your type of Internet connection, and is compatible with the vast majority of firewall configurations. o Secure Chat – The chat feature allows two, three, or more users to communicate to each other in persistent window, with all the same security features as X-IM Instant Messages. This is ideal for encrypted group conversations between three or more users. Firewall Compatibility – X-IM is designed to automatically connect you with your contacts regardless of your type of Internet connection, and is compatible with the vast majority of firewall configurations. o Digital Signatures and Hash Protection - All X-IM communications, besides being digitally encrypted to prevent unauthorized viewing, are also digitally signed and protected by secure hash to prevent the forging or altering of any type of X-IM message. o Message Filtering – Automatically filter out messages from designated users, or opt to only receive messages from users already on your contact list. o Secure Memos – Secure memos are like secure instant messages, except that there is no length limitation, and they can be retained locally by the recipient indefinitely. This makes them very convenient for sensitive information that needs to be retained, like account numbers, passwords, schedules, etc. o Digitally signed documents – This feature automatically applies your digital signature to any memos or files you send. This gives the recipient proof that the document or message came from you and has not been altered since it was sent. o Compact Size and No Ads – The Pro Version doesn’t display the ads which pay for the free version. This frees up room on the screen and provides more room for the information that you want to see.